We’re very excited to announce the launch of a new series on the Kimchi Chronicles blog! 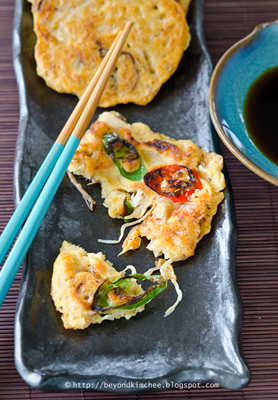 Each week, we’ll be featuring some great Korean recipes from writers all over the blogosphere. 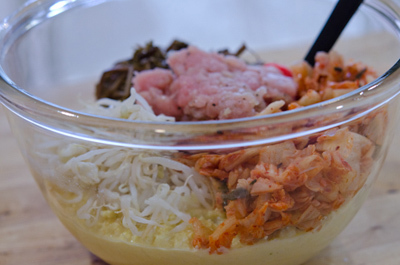 We’ll make it our goal to supply you with the internet’s freshest Korean dishes. For our inaugural post, Holly from Beyond Kimchee is sharing her take on the Kimchi Chronicles bindaetteok recipe, complete with step by step instructions and beautiful photos. 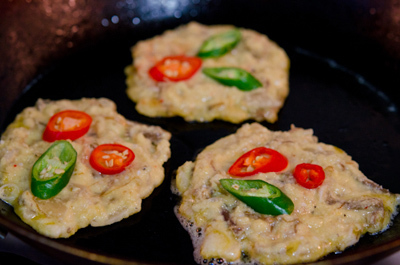 I was asked to make a dish using one of the recipes in the Kimchi Chronicles, so here I am, presenting a wonderful savory mung bean pancakes recipe called bindaetteok. Although this dish used to be considered as poor man’s fare, it’s an undeniable favorite with Koreans of every social class. It might have started as a humble dish for commoners butthe flavor is as rich as the Queen of England! I adapted Mrs. Rhee’s bindatteok recipe in the Kimchi Chronicles cookbook, with a few tweaks to make it my own. 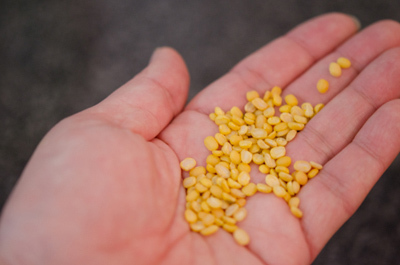 Mung beans are tiny, whole green-colored beans. 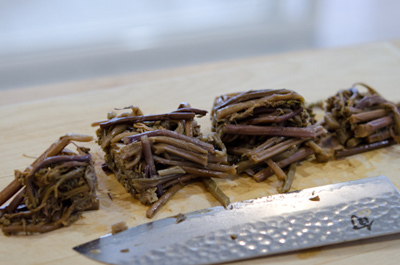 I recommend using split mung beans; their skins have already been removed, revealing a delicate yellow bean. You can find these easily in any Asian grocery store. 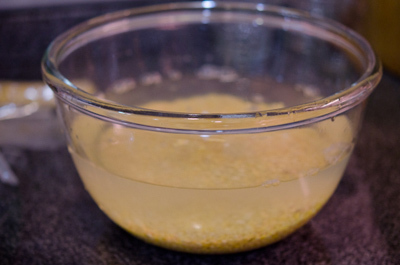 Combine mung beans and rice in a large bowl. Add cold water and soak for at least 6 hours (up to 24) in the fridge. Drain and rinse them. Set aside. This is Korean wild fern. You can omit this if you can’t find it. 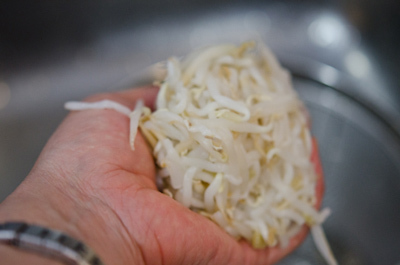 Blanch mung bean sprouts in boiling water for 1 minute and squeeze gently with both hands to remove some moisture. 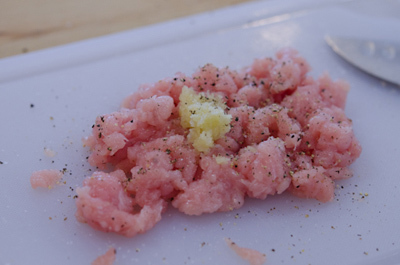 Chop your very fermented kimchi and set aside. Put the beans and rice in the blender and process with 1/4 cup water. 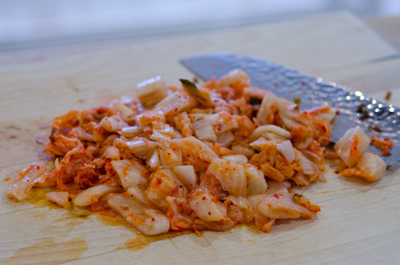 Add 1/2 cup kimchi juice for the blade to turn and stir a bit, so it can all can blend easily. 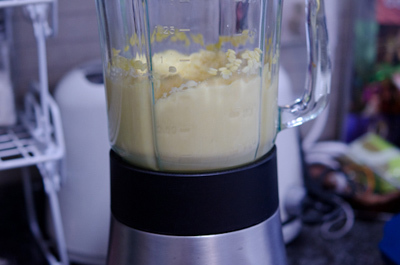 Do not over puree, it should be coarsely smooth. Pour the mixture in a large mixing bowl. 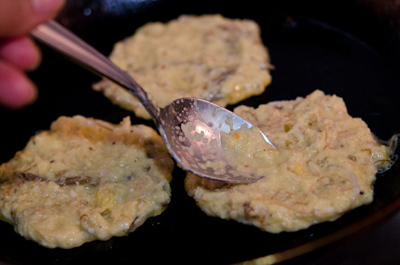 Heat a generous amount of oil in the skillet over medium heat and and spread 2-3 tablespoonful of batter for each pancake. 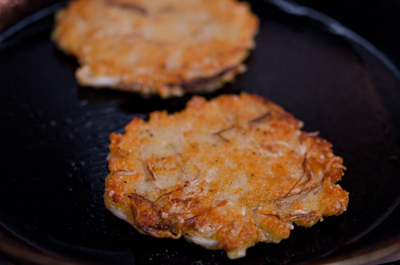 Cook for 3-5 minutes on each side until the pancake is brown and crisp. Add more oil if the pan seems dry. As a garnish, place a few chiles if you like. Yum, yum, yum! 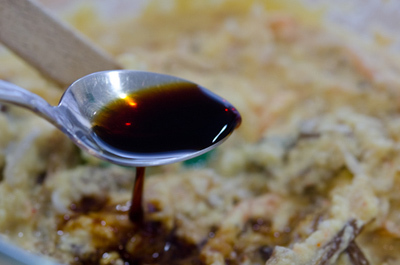 Many Koreans eat these pancakes with soju, but they go just as well with a cold glass of Coke. Just like any savory pancakes, this should be eaten immediately when it’s hot. They get tough once they’ve cooled down. As always, serve with dipping sauce!